The media is all around us, and informs our opinions and impressions of the world every day. This is especially true for science reporting, and children should know how to regard media representations of scientific discoveries, theories and public information with a critical eye. This sequence of lessons aims to facilitate pupils’ deeper engagement with such content. 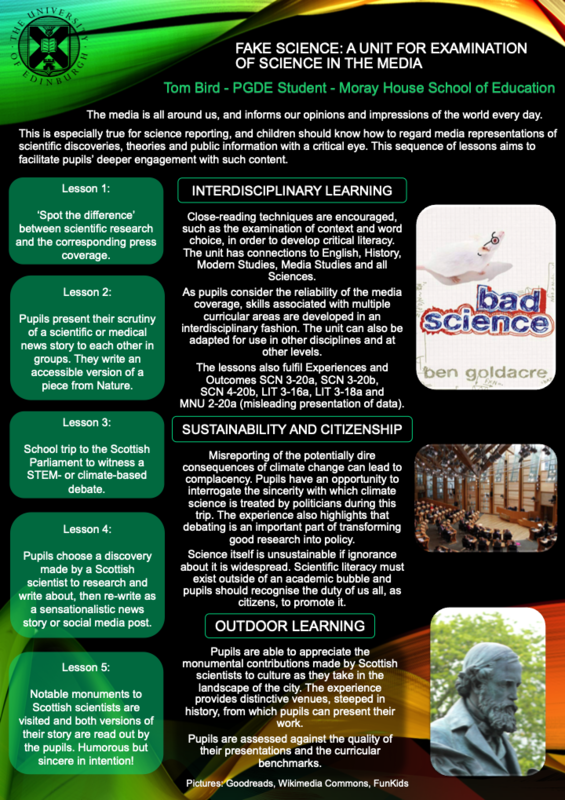 This poster will be presented at the RSE Conference on Interdisciplinary Learning in January. Vanilla is one of the most common and powerful ingredients found in many sweet treats worldwide, however, the story of its production is anything but vanilla! Being the second most expensive spice in the world after saffron; per kilo vanilla has a value greater than that of silver, which isn’t helped by the fact 80% of the world’s vanilla supply is grown by one island nation – Madagascar. During this unit of work, pupils will use a variety of interdisciplinary learning to understand the below topics of interest related to the overall sustainability of this fascinating orchid. 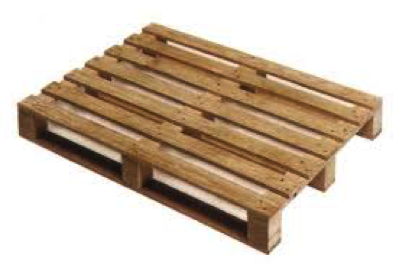 There are currently millions of pallets in circulation across the UK. The industry itself is worth over £260 million per year. After their initial use a variety of things can happen to a pallet: it can be discarded and put to landfill; reused multiple times and then put to landfill; refurbished, reused but it still ends up in landfill. Up-cycling is a greener way of recycling, it only uses the individual’s energy. It helps to stop the linear path that the pallets are currently on and turns it into a cyclic process with little waste after manufacture. This unit is designed to encourage learners to take products that have become redundant or that are destined for the bin and create a new use for them. For more details, download the presentation here (.pptx, 985KB). In this unit we will be looking back at the history of Scottish forests, looking first at the ways in which the trees first populated Scotland after the last ice age. From there we will look at events which have impacted upon forest populations before looking at how the forests of today are used now. Pupils will be encouraged to research topics of interest. The main focus of this unit will be climate change and how this will effect our forests. This unit will also deal with a theoretical situation in which the ice has melted from the polar ice caps and places such as Greenland. Download the poster here (pdf, 806KB). This unit of work is designed to provide pupils with information on where their food comes from and how we can produce food for a sustainable future. Pupils will undertake a wide variety of activities to enhance their understanding of the topic and to develop valuable life skills. The topic will use active learning though discussion and outdoor learning to enable the pupils to develop a deeper and more personal understanding of the unit. Pupils will also use enquiry skills to evaluate their own diets to lead them towards healthier life choices. Pupils will look at the local community and how the surrounding area has in the past provided sustainable food sources as well as how it can do this in the future. In this unit questioning will be used to guide and support topical discussions such as a debate on GM crops. Through this pupils will develop a wide range of skills relating to literacy, health and wellbeing and science. The topic will be linked to information that has been previously covered by other subject areas as well as topics yet to be covered in other subjects to provide an interdisciplinary experience for the pupils. Download the poster here (pdf, 464KB). This unit of work has been designed as a partnership project with learners and teachers working in partnership with the Forestry Commission Scotland and the Ellen MacArthur Foundation. The case study task included in this unit also provides learners with an outdoor learning opportunity providing relevance and depth to the curriculum. The real-world context, use of partnership working to provide live clients for the design challenge and problem based nature of this unit create an authentic context which should both engage and motivate learners, providing challenge and enjoyment in line with the Principles of Curriculum Design. 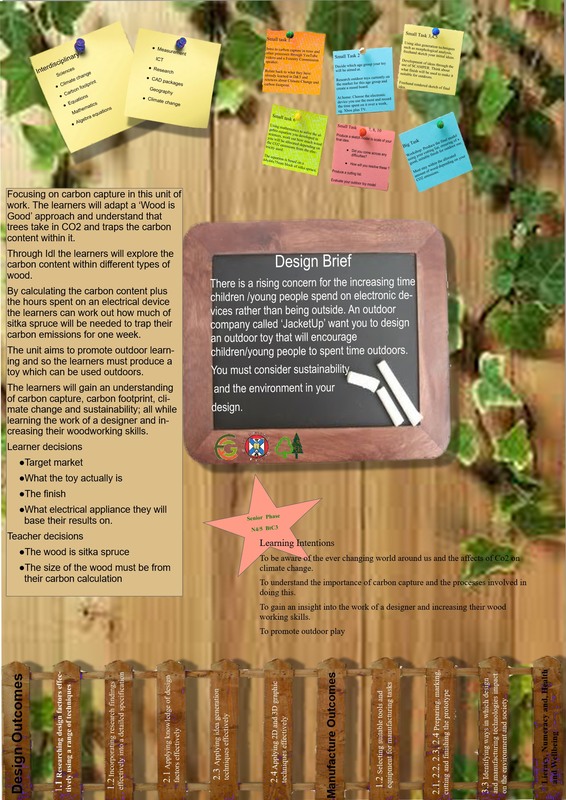 The big task associated with this unit of work contains an element of competition with each learners design solution being tested and evaluated by the client ending in one winning design proposal. The inclusion of this competitive element can be seen as a further motivator for learner engagement and also provides an opportunity for personal achievement, listed as one of the purposes of senior phase education. The underlying focus of this unit of work is sustainability. The unit aims to inform learners about the issue of climate change and ways in which CO2 emissions can be reduced through carbon capture and the use of wood in construction from local, responsibly managed forests instead of other materials such as metals and plastics. The knowledge and understanding of issues relating to sustainability developed in this unit will assist learners in becoming responsible citizens who are able to evaluate environmental, scientific and technological issues, develop informed, ethical views of complex issues and make informed choices and decisions. 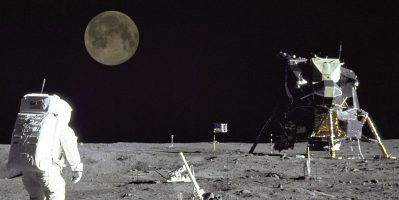 This unit of work has been developed as an interdisciplinary STEM project based on National 4 and 5 Engineering Science and including elements of Mathematics, Physics and Graphical Communication. 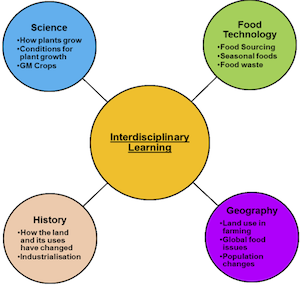 Interdisciplinary projects allow learners to make connections between different subject areas and provide the opportunity to create inspiring contexts that provide relevant, challenging and enjoyable learning experiences. It is my intention that different sections of this unit will be taught by staff from each of these subjects, providing expertise in each area and making the links between each subject explicit to learners and. It is also intended that the interdisciplinary, STEM setting of this unit will provide an exciting and thought provoking context for learners. Throughout this unit there are opportunities to develop skills for learning, life and work. The cost and presentation of the design solution to the client are integral to the success of the project, developing learner s enterprise and presentation skills. The majority of tasks within the unit support the development of learners’ numeracy and literacy skills. Learners also take part in two group work activities developing their employability skills and capacities as effective contributors. The design challenge develops learner s creativity and thinking skills requiring them to understand and apply knowledge to analyse, evaluate and solve a design problem, developing their capacities as successful learners and effective contributors who are able to think creatively, solve problems and make reasoned evaluations. As this unit is designed to fulfil outcomes from National 4 and 5 courses, summative assessment will be conducted under SQA guidelines. Formative assessment will also be used throughout the unit to support the learning process, inform next steps and provide a good basis for reporting on progress. 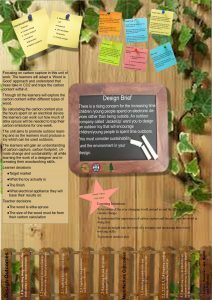 Learners will receive feedback on their designs and presentations from the client and are asked to undertake self-assessment by evaluating successful and unsuccessful designs at the end of the unit. The incorporation of self-assessment in this unit links to the roles and responsibilities laid out by The Scottish Government which state that learners should review their own learning through self-assessment and that teachers should involve learners fully in assessment . Download the poster for full details and references here (pdf, 2.9MB). Focusing on carbon capture in this unit of work the learners will adapt a “wood is good” approach and understand that trees take in CO2 and trap the carbon content within it. Through IDL the learners will explore the carbon content within different types of wood. By calculating the carbon content plus the hours spent on an electrical device the le arners can work out how much Sitka spruce will be needed to trap their carbon emissions for one week. The unit aims to promote outdoor learning and so the learners must produce a toy which can be used outdoors. The learners will gain an understanding of carbon capture, carbon footprint, climate change and sustainability, all the while learning the work of a designer and increasing their woodworking skills. Download the poster by clicking on the thumbnail (jpg, 863KB). Wood is a renewable resource, economical and a very strong building material. This knowledge should be used in the context of developing our own community for the future. Wood is a store of carbon and it reduces the greenhouse effect by removing carbon dioxide from the atmosphere. This is an S3/S4 Project which uses cross-curricular skills to construct a model vision of the local community’s integral public use buildings. The only prerequisite is that the principal construction material is wood. Download the poster here (pdf, 368KB). The hedgehog population is in dramatic decline: numbers have declined by over a third between 2003 and 2012 through loss of habitats (fragmentation) and poor management of hedgerows. 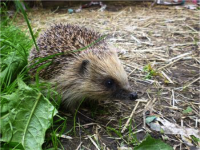 In this interdisciplinary project, learners will learn about the natural environment for a hedgehog and the importance of protecting the hedgehog species, and will design and manufacture a hedgehog house. Download the project overview here (pptx, 820KB). Throughout Earth’s history its development has been dictated by natural occurrences, even where these events have been destructive. However, particularly since the Industrial Revolution Humanity’s negative impact on the environment such as through the release of greenhouse gases has been steadily increasing. With the worldwide population now having exceeded 7 billion, it is estimated that on average each person worldwide uses the equivalent resources of 3.5 Earths whilst every person in the UK uses the equivalent of 1.5 Earths. With the population worldwide set to increase over the next few decades the current situation is unsustainable and must be addressed. This unit aims to introduce sustainability over the course of a total of 12 lessons and assumes that participants have little knowledge of climate change. The awareness of climate change and its associated issues will be built-up throughout the unit leading to the opportunity for pupils to present their findings, etc. Elements of Science, Technology, Engineering and Mathematics are present to varying degrees throughout the proposed lessons and are designed to be flexible should new content be introduced. The tasks also have a multitude of learning opportunities, including: group work, communication development via presentations & discussions, guided research tasks and practical activities. Transferable skills are also developed with links made to engineering and the chance to plan a conservation project offered. The Curriculum for Excellence encourages outdoor learning, the promotion of sustainability and multidisciplinary learning and this unit aims to meet these criteria. Download the poster here (pdf, 615KB).